We have 22 acres of woods and a park area great for ATVing, biking, hiking, birdwatching. We have 60 sites: 2 are W/E and the others are full hook-ups and pull throughs - some with 30 amp and some with 50 amp service. We also have a couple of back-ins for over-flow. 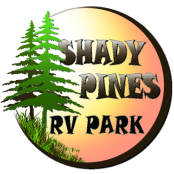 We also have 21 park owned RV's for monthly rental and 5 cabins for monthly rentals. These two structures are the first you see when pulling into the park. If you've see them once, you'll never forget them. A quick knock on our door, and we'll be there to meet you. We have 3 brand new washers and 3 brand new dryers. If you prefer large commercial machines they are available in town just down the road. There is a coke machine with many popular sodas. we keep plenty of coin at our office your convenience. Restrooms are private, roomy, family sized and kept very clean. They are handicapped-accessible. We also offer laundry service. We have a playground for the kids with a table there for caretakers. Park residents are always having their own cook outs in different corners of the park, grilling with friends, or just relaxing with company, maybe a band for music. We have a coke machine stocked in the bathhouse for your convenience. Enjoy 20 acres of woods as a pot belly pig strolls through the park, rabbits and deer sleep under our fig trees and grape vines, while kids enjoy a canoe ride in the pond. Ride your ATV or stroll down the natural scenic paths. 7 days a week for your convenience, we have propane cylinders available for exchange. Just $20 per tank. The forest has a little pond for catching the rain run-off over by H-row. There are 13 different types of trees and counting on our 22 acres. There's ATV trails and mud pit, birdwatching, biking, critter sightings, and camping. Or, if you'd rather, simply lean back and listen to the whispering pines and singing birds. Stretch out and relax with more room and maybe some plants to make you feel at home. These are some of the larger sites that can have special features like decks or carports for the guests that like to stretch out and stay awhile. They usually always stay rented, so call ahead.